Zak Gipson opens USAA's new innovation exhibit space. 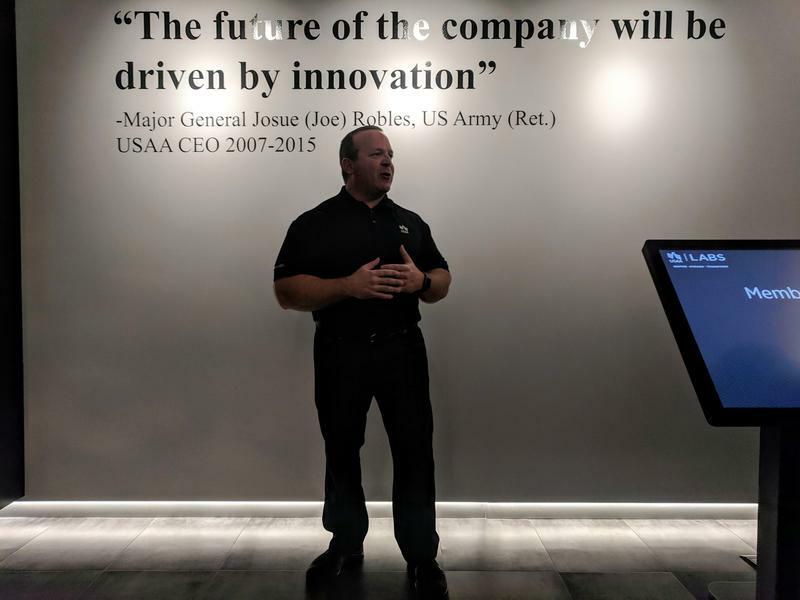 There’s an unmistakable Disney’s home of tomorrow feel to an exhibit at USAA’s new innovation exhibit space, at its Fredericksburg Road headquarters. It’s called the empathy lab, and when you walk in, a disembodied voice — somewhere between Amazon’s Alexa and Apple’s Siri — greets you. At first glance, nothing sticks out about the living room layout other than the number of tablet-like screens under a big screen TV. The suburban look is camouflage for the the number of products set up to assist people with different needs. There’s a smart mirror that provides commute times and weather. There’s a doorbell for the hearing impaired that uses the room’s lights to signal someone is at the door. “It’s a place where we can showcase how connected homes can improve the quality of life for our members,” said Mitzi Ruiz, strategic innovation director for USAA Labs. The centerpiece is how multiple devices are integrated specifically for veterans with post-traumatic stress disorder. USAA provides financial and other services for military members and their families. “He’s just gotten back from a deployment and he’s sitting down with his son to watch a show on YouTube,” said Tony Farnsworth, who was running the exhibit. As he watches, an advertisement pops up for the WWII movie “Dunkirk.” It triggers an emotional response, which a wearable device detects from his rising heart rate. For dramatic effect, the room’s lights fade up with his increasing heartbeat. The lights then change to a calming blue, after the TV changes to a beach scene. The thermostat adjusts the temperature downward — all things researchers at USAA labs said should help those suffering from PTSD. Finally, Amazon Alexa dialed a preprogrammed friend. “We want to be able to put ourselves in their shoes and help them,” Farnsworth said. The empathy lab is just one of nearly a dozen exhibits in the of the 1,288 square foot space. 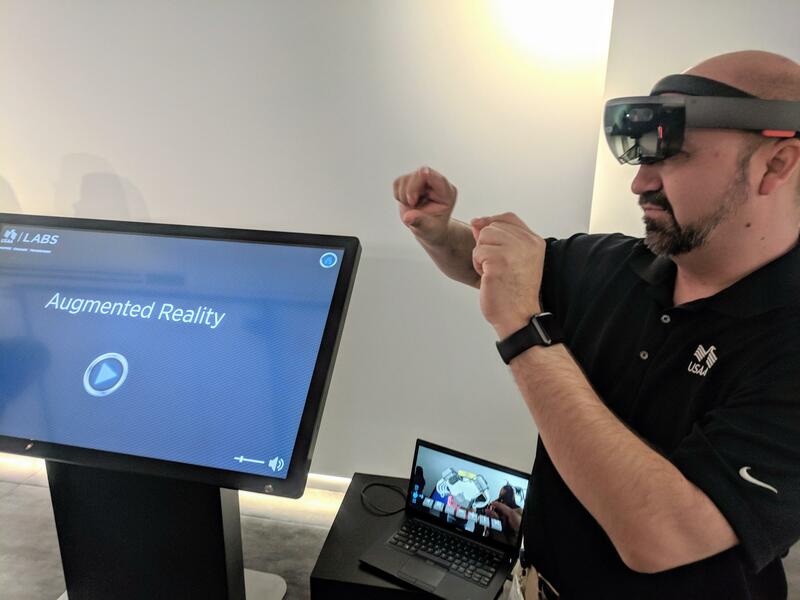 Drones and satellite maps USAA has used to facilitate claims sit alongside a mock up of an augmented reality rig, using Microsoft’s HoloLenses, a headset that lets you interact with 3-D models. USAA research engineer Carlos Chavez examines a digital engine in augmented reality. “This could be used to help training for (claims) adjusters,” said Carlos Chavez, a USAA research engineer. Innovating to meet member needs is the reason USAA labs exists, company officials said. But USAA’s innovation programs are also to engage employees. Company officials often talk about its 90 percent participation rate in the volunteer innovation program. More than 700 patents are posted on the wall of this new exhibit space, many from employees outside of USAA Labs. Friday’s opening also featured the debut of more than 20,000 square feet of USAA’s new facility, which includes a co-working space. Shawnta Swindell didn't want to miss the United Services Automobile Association's annual Innovation Day. Her employer hosts these daylong celebrations of employee-driven innovation projects at all their financial service centers. 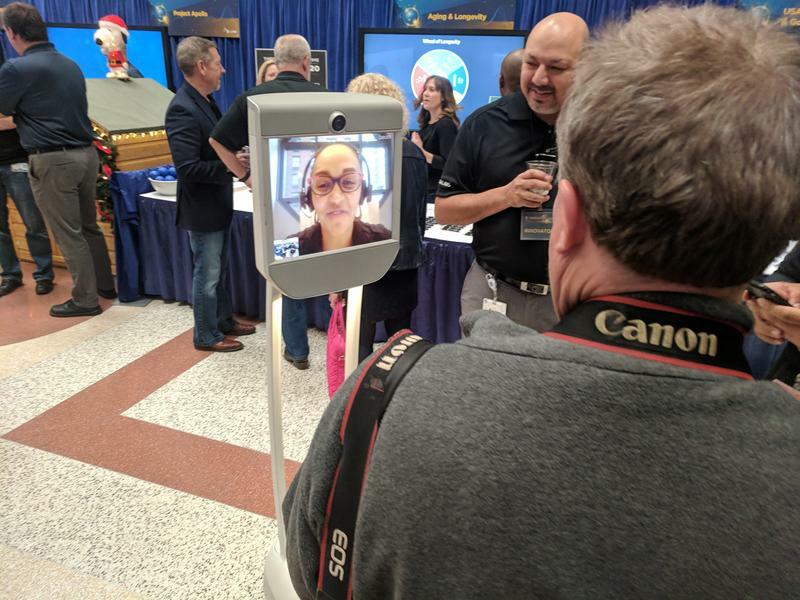 But Tuesday’s event at USAA’s San Antonio headquarters was a problem for Swindell because the research and development employee works remotely, so from New York City she broke out her robot here. Trouble Talking About Money? Try Talking To This Robot. Cash. Moolah. Loot. You might not know it but those colloquialisms for money can really throw a machine for a loop. USAA launched a pilot program Wednesday allowing customers to use Amazon's popular smart-home device, Alexa, to talk turkey about their accounts and their spending. "Alexa, how much have I spent on gas?" asks Gualberto Camacho, USAA's Strategic Innovation Director. 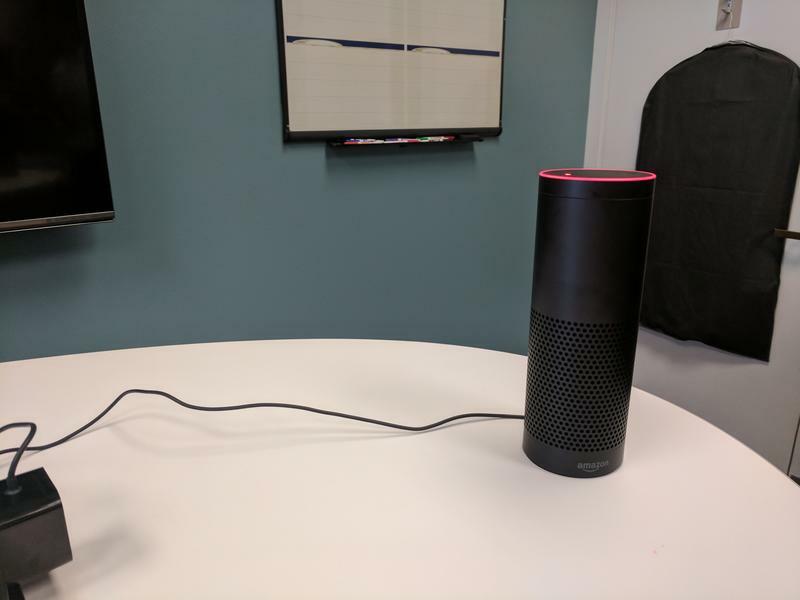 "You've spent $20.19 on gas stations, oil and gas over the last three months," says the disembodied voice of the cylindrical speaker known as Amazon's Alexa. A tool released by USAA Labs late Thursday night allows homeowners affected by Hurricane Harvey to get a sense of what their coastal home may be like when they finally get access. Using aerial photos and image mapping technology, they created a map.